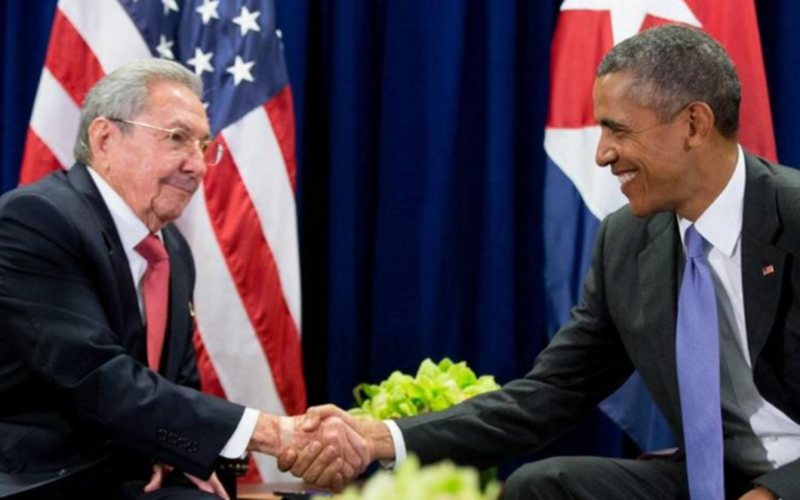 President Obama and Cuban leader Raul Castro shake hands during a bilateral meeting at the United Nations Headquarters on Sept. 29, 2015, in New York City. NOTE to students: Before reading the article, read the “Background” and “Resources” below the questions. (by Alyana Alfaro, PolitickerNJ.com) – On Thursday, President Barack Obama officially announced on Twitter that he would embark on a historic trip to Cuba. While Obama said that his visit will advance the United States’s “progress and efforts that can improve the lives of the Cuban people” many of New Jersey’s Cuban-Americans (from both political parties) are taking the opposing stance. Not all of New Jersey’s lawmakers agree that the move by Obama to visit Cuba is a bad decision, however. New Jersey Assemblyman Reed Gusciora (a Democrat from NJ’s 15th district) recently traveled to Cuba on an unauthorized legislative trip made by ten New Jersey Assemblypeople. According to Gusciora [who is not of Cuban descent], opposition to the president’s trip mainly comes due to a lack of firsthand experience with the situation on the ground there. According to NJ State Senator Ray Lesniak (a Democrat from NJ’s 20th district), time will tell if the decision made by President Obama, and the decision of Pope Francis to visit Cuba this week, will be beneficial. Reprinted here for educational purposes only from PolitickerNJ, which delivers political news that matters to New Jersey. May not be reproduced on other websites without permission from PolitickerNJ .com. 2. List the NJ lawmakers opposed to President Obama’s visit. For each, explain the reasons for their opposition. (What did each say?) Be specific. 3. Who joined NJ Rep. Sires and Senator Menendez in the press conference they held to publicly oppose President Obama’s trip to Cuba? 4. What is Representative Sires calling on President Obama to do? a) Do you think President Obama’s trip to Cuba will cause the Castro brothers’ Communist regime to give freedom to the Cuban people, to free all political prisoners, to extradite Joanne Chesimard? Explain your answer. The Republic of Cuba is one of the world’s last remaining socialist countries following the Marxist-Leninist ideology. The President of Cuba, who is also elected by the Assembly, serves for five years and there is no limit to the number of terms of office. Throughout 2015, there were more than 8,616 documented political arrests in Cuba. In November alone there were more than 1,447 documented political arrests, the highest monthly tally in decades. Those numbers compare to 2,074 arrests in 2010 and 4,123 in 2011. . . . According to the London-based NGO, Christian Solidarity Worldwide (CSW), last year 2,000 churches were declared illegal and 100 were designated for demolition by the Castro regime. Altogether, CSW documented 2,300 separate violations of religious freedom in 2015 compared to 220 in 2014. . . . Most of the 53 political prisoners released in the months prior and after Obama’s December 2014 announcement have since been re-arrested on multiple occasions. Five have been handed new long-term prison sentences. On Feb. 19, U.S. Senator Marco Rubio (R-FL) responded to President Obama’s plans to visit the communist island of Cuba. In a letter to the President, Rubio warns of the consequences such a trip would pose, and urges him to reconsider. Your determination to visit the communist state of Cuba on March 21st and 22nd, regardless of the disastrous consequences, is a mistake. I strongly urge you to reconsider visiting Cuba in the absence of the government undertaking meaningful reforms including: reforming their oppressive political system, reigning in a police state that orchestrated over 8,600 political arrests in 2015, freeing all political prisoners, resolving the billions of dollars in outstanding property claims and court judgments against the Castro regime, and returning fugitives from U.S. justice. In other words, having an American president go to Cuba simply for the sake of going there, without the United States getting anything in return, is both counterproductive and damaging to our national security interests. Any time a president visits a foreign country, it speaks volumes to the host country, to the American people and to the rest of the world. If you proceed with this visit, you will further confirm what the Castro regime has learned throughout its negotiations with your Administration: that you are willing to give up all the leverage the United States has in exchange for virtually nothing. You will send the message to the oppressed Cuban people that you stand with their oppressors. You will send the message to the Western Hemisphere and the rest of the world, especially our enemies, that the United States can grow tired of standing up for our national security interests and principles. Furthermore, your Administration’s recent handling of its re-opening of the U.S. embassy in Havana demonstrated complete diplomatic incompetence that does not bode well for a future presidential visit. That event further proved to the Castro regime that it can get extraordinary concessions from your government in exchange for nothing. That episode also showed a blatant disregard for the patriotic Cuban dissidents who have toiled for years in advancing the cause of freedom only to be shut out of the public ceremony on August 14, 2015. A presidential visit to Cuba would inevitably entail staying at hotels and other accommodations controlled by the Cuban military, providing American taxpayer dollars to the regime, in addition to the economic concessions you have been making over the past year. As you know, the island’s repressive apparatus is under the iron fist of Raul Castro’s son, Colonel Alejandro Castro, while the economy remains under the control of the lucrative military monopoly, Enterprise Administration Group (GAESA), run by Raul Castro’s son-in-law, General Luis Alberto Rodriguez Lopez-Callejas. To date, the concessions you have given to the regime have strengthened Castro’s military monopolies not the Cuban people. In sum, I urge you to reconsider visiting Cuba and instead insist that the Castro regime finally make some serious concessions that have so far not been prioritized in negotiations. Before you announced your new Cuba policy on December 17, 2014, the United States possessed significant economic and diplomatic leverage over the Castro regime. Rather than achieving several long-standing U.S. goals and national security interests, you have methodically squandered this opportunity, legitimizing the Castro regime and enriching it in the process. A presidential visit to Cuba absent of any concessions from its government is a dangerous idea, and I urge you to reconsider.